Amazing place to stay. The staff is wonderful. Comfortable beds and great chill out areas. The kitchen is a big plus. The staff are so nice and friendly, rooms are clean and the shower is hot, kitchen is well equipped, rooftop area is really pretty. They have a dog that is super cute. Free coffee and filtered water is a bonus. Only downside was the bed was a bit hard and the pillows were lumpy, but that might have just been our room. 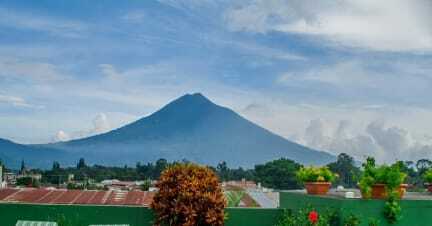 We really enjoyed our stay here at Hostal Antigua. We had a private room with a bathroom, which was very clean. The WiFi connection is good and the kitchen facilities are basic but useable. The staff were always very polite and helpful. The atmosphere in the hostel is quiet and there is no hang out area to meet people. 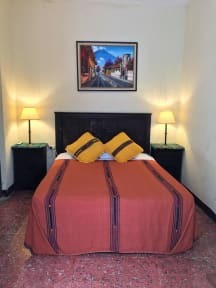 You will enjoy your stay here if you take it for what it is; a nice, clean, quiet place with all the necessary facilities needed for a comfortable stay. Really great little hostel. We stayed in a Private Room, and although it was a little on the small side, it was absolutely fine. Staff are friendly and helpful (including the dog, Cleo!). Great stay and friendly helpful staff. No atmosphere. Shower and toilet was located downstairs and was tiny which made it hard changing rather than walking through the place in a towel! Not great WIFI and kitchen facilities. Good location and nice outside area but that was about it.